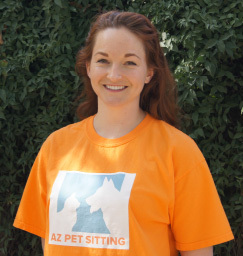 Ashley Trueman is passionate about the causes that are close to her heart, so it comes as no surprise that she is a genuine “crazy pet person.” She describes herself as an avid pit bull advocate and “purebred mutt” lover. She keeps a leash in her car so that she is prepared when she stops for strays. Recently, she fostered her first dog for a local rescue group. Ashley grew up in the San Diego area in a family of pet lovers. She attended ASU where she earned a BS in Kinesiology and a Masters in Business Marketing and Management. She worked her way through college as a nanny specializing in caring for special needs children. Then, after graduating, she spent several years working in sports marketing and non-profit fundraising, and also began working with families of newborns as a post-partum doula. With the exception of spiders, Ashley is comfortable with just about all animals, including dogs, cats, birds and reptiles.